By a score of 1-0, the No. 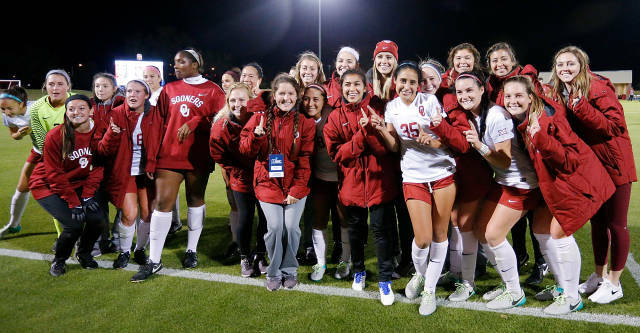 25 Oklahoma soccer team defeated SMU in the first round of the NCAA Championship on Friday night at John Crain Field. The win was the first for the Sooners in NCAA action in their history. Additionally, the victory gave the Sooners 14 on the season, marking the highest single-season win total in program history (won 13 in 2005). OU, who is celebrating its 20th anniversary this season, also made postseason appearances in 2003, 2010 and 2014. “I think the team’s shown all year it can do whatever it wants to do when it performs. It never knows when it’s done, so that’s obviously a good characteristic," fifth-year OU head coach Matt Potter said. "The days of hard work have instilled that in them. I think we’ll always go into a game prepared, so the staff that we have behind the scenes has been exemplary in terms of preparation, whether it be physical, or whether it be video. So, we’ll always go into it with a game plan. We’ll go in it with talented players, so that always gives you a chance, and then it comes down to performing on the day, which is just about handling the environment and handling the stage that you find yourself on." The Sooners jumped out to the early advantage by making good use of a set piece. After junior Tori Bowman sent a free kick into the box from midfield, sophomore defender/midfielder Paige Welch found it and headed in the score. The goal was the first of the season for Welch, while Bowman now has three assists. OU (14-6-2) was outshot by the Mustangs (13-7-2) by a 7-6 clip and 4-2 in shots on goal. Seniors Liz Keester and Madison Saliba both recorded a pair of shots, while senior Shiloh Price added one. Redshirt senior goalkeeper Kassidie Stade tallied her ninth shutout of the season and 20th of her career, extending her OU program records in both categories. She finished the match with four saves. SMU sophomore goalkeeper Catie Brown grabbed one save and allowed one goal in the contest. Oklahoma will take on No. 4 BYU in the second round of the NCAA Championship. The date and time of the match will be announced at a later time. The second and third rounds will be played at Stone Stadium in Columbia, S.C., with No. 3 South Carolina and the winner of Colorado and Oklahoma State as the other competing teams in the region.